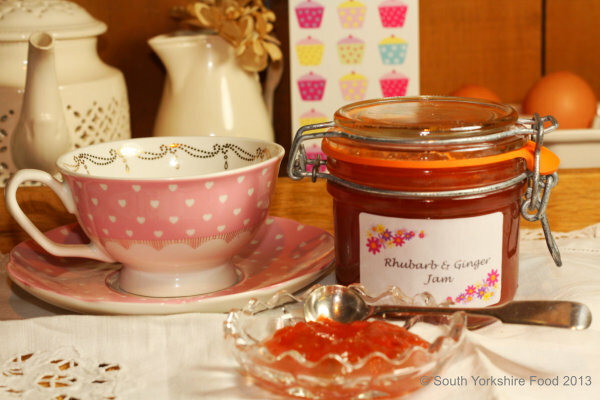 This is a scrumptious jam made with the first crop of Yorkshire Rhubarb, for which Yorkshire is justly famous; created by guest chef Brenda Clough, the rhubarb came from the garden of Cortworth House, Wentworth. The jam is sweet and tangy, ideal for spreading on a scone or on a Yorkshire Fat Rascal! This should make about 4 or 5, 400g jars. 1kg rhubarb, washed and diced. Note: don't peel the rhubarb as it is the red colouring in the skin that gives the jam the lovely pink colour. 1.5cm of fresh ginger, peeled, and grated. Put the rhubarb in a large saucepan and pour the sugar and the syrup over the rhubarb and leave for one hour. Add the chopped stem ginger, grated ginger, lemon juice, and grated lemon zest.